A patient of mine recently provided a great reminder of the importance gastrointestinal health plays not only in overall health and wellbeing but also in the resolution of chronic pain. This patient was making great progress in resolving chronic nerve pain caused by an injury. His pain levels had reduced enough that he was able to completely stop taking the strong pain medications he had been prescribed for several years. Then he came into the clinic and complained that he had a spike in his nerve pain over the weekend and was also experiencing aching hands, general muscle aches, and fatigue. He also had trouble sleeping and felt restless in general. My first question was, “what did you eat on the weekend?” As I predicted, he had quite the weekend and had abandoned the dietary regimen I had prescribed for him. He enjoyed a lot of foods with dairy, refined carbohydrates and other refined sugars. Or at least he thought he enjoyed them. He didn’t realize how much eating those foods would aggravate his pain and cause additional discomfort. So how did the foods he ate over the weekend contribute to all of this pain, insomnia, and agitation? The answer comes from understanding a little about leaky gut syndrome and the resulting immune response and inflammation caused by certain foods. 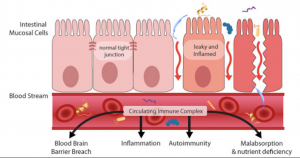 This will not be a comprehensive discussion on leaky gut, but it can serve as a review for those already familiar or an introduction for anyone new to this condition. Leaky gut, intestinal dysbiosis, and intestinal hyperpermeability are different names for the same condition. The gap junctions of the intestines (which are supposed to form tight bonds that prevent foreign particles from entering the bloodstream) are broken, and this causes larger molecules, in the forms of undigested proteins, to be able to enter the bloodstream. Because these proteins are recognized by the immune system as being foreign, invading molecules, it launches into action to destroy and eliminate them. This immune activation causes an increase in inflammation. (Inflammation is the body’s response to the threat of harm, injury, or invasion by pathogenic organisms. Because these undigested proteins are not supposed to be in the bloodstream, they are considered to be invading, pathogenic organisms by the immune system.) The resulting inflammatory response caused by this reaction to poorly digested food will increase pre-existing pain, and it can also cause pain from arthritis or old injuries that have not hurt for a while to start hurting again. Because the inflammatory response is happening in the bloodstream, inflammation becomes systemic (body-wide) and this can lead to generalized muscle aches and aching joints (most commonly the small joints in the hands and feet). The severity of leaky gut symptoms varies from person to person. Many people may have low-grade symptoms and not attribute them to the gastrointestinal system, whereas others have severe symptoms. Common symptoms include gas, bloating, constipation and/or diarrhea, stomach pains, heartburn, nausea, frequent colds and flu, headaches, brain fog, difficulty concentrating, poor memory, insomnia, fatigue, and various manifestations of chronic aches and pain. A leaky gut will complicate autoimmune disease, and it can also play a role in certain adrenal and thyroid problems. So what causes leaky gut? And, more importantly, what can you do about it? Antibiotics destroy the beneficial bacteria in the intestines that help to form a protective barrier for the intestinal wall. These beneficial bacteria also work to destroy harmful bacteria, strengthen the immune system, and digest food so that nutrients and energy can be extracted from them. People with leaky gut will suffer from malabsorption and, therefore, nutrient deficiencies–even if they are eating healthy. Alcohol can damage the protective barrier of the intestines, and even moderate alcohol consumption can increase endotoxemia, which is the presence of bacterial toxins left after bacteria die and break down. These toxins further increase the permeability of the intestinal lining. Sugar in the form of simple, processed sugars and refined carbohydrates also contribute to intestinal permeability. Refined sugars are absorbed via transcellular absorption, which, in turn, up-regulates the paracellular route. What does that mean? Refined, processed or simple sugars cause the leaky gut to get worse. Gluten, according to recent research, leads to increased permeability of the gut lining, even in healthy subjects. Intestinal cells exposed to a component of gluten (gliadin) show higher permeability than those in healthy controls. This can happen within minutes of consumption. Because gluten can cross-react with other proteins, studies show that people may suffer from sub-clinical reactivity, which means that while it may not cause celiac disease or other serious illness, it can still contribute to inflammation and increased damage to the intestine’s protective barrier. Trans Fatty Acids aka trans-fats are found in industrially produced vegetables oils that are used for frying foods or added to processed food to prolong shelf life. In addition to being difficult to digest, these fats will damage the intestinal barrier and contribute to increased inflammation in the body. NSAIDs (Nonsteroidal anti-inflammatory drugs), such as aspirin, ibuprofen, and Celebrex, among others, increase intestinal permeability in as little as 24 hours. Stress hormones increase intestinal permeability by damaging the protective barrier of the intestines. They also increase destruction of beneficial bacteria, which increases bacterial toxins and further damages the lining of the intestines. Low hormone levels and insufficient digestive enzyme production can also contribute to food reactivity and leaky gut syndrome. So now that you know what causes leaky gut, and how that can contribute to chronic inflammation and pain, what should you do? Eat a diet that is low in refined carbohydrates and simple sugars and has an abundance of lightly cooked vegetables. High fiber from vegetables has several functions. It is a beneficial prebiotic, which means it provides a habitat, food, and a breeding ground for beneficial bacteria. It also lowers intestinal pH levels. Avoid processed foods. These tend to contain trans-fats and other preservatives and coloring agents that the body is not able to break down properly, and thus they fuel inflammation and contribute to the further damage of the intestinal protective barrier. Eliminate dairy from your diet. This is another common food that the body has difficulty digesting. Even if you don’t notice any gastrointestinal symptoms when you eat dairy, in my clinical experience, it is one of the most significant contributors to inflammation and pain. Remove gluten-containing foods from your diet. Because refined carbohydrates and simple sugars also contribute to leaky gut, be careful you don’t just replace all of your gluten-containing foods with gluten-free foods and think you are fine. Eating too many gluten-free alternatives can still result in a diet high in carbohydrates. In addition, lots of gluten-free foods contain more salt and sugar to make up for flavor and textural changes. Even if you are consuming gluten-free grains, still maintain a lower carbohydrate intake as part of a balanced diet. Add coconut oil and bone broths to your diet. They will help to repair the intestinal barrier and lower inflammation. Together, these dietary recommendations strengthen gut lining integrity, help to repair leaky gut, lower inflammation, reduce pain, and increase energy levels. Try to avoid the use of NSAIDs. These will also damage the intestinal protective barrier. This will contribute to leaky gut, chronic inflammation and pain, which will lead to further use of NSAIDs. A vicious cycle is created with no resolution of pain, and further damage caused by prolonged NSAID use. Excessive use of NSAIDs can also result in damage to the kidneys and liver. The most commonly reported side effects of NSAIDs include gas, bloating, nausea stomach pain, heartburn, diarrhea and/or constipation. Sound familiar? Instead of NSAIDs, try using Turmeric Extract (Curcuma longa). A lot of research has shown that this is a powerful anti-inflammatory. The concentrated liquid extracts are better absorbed. Pills don’t absorb as well, and there is no way to get the clinically effective dosage by just adding turmeric to your diet. In addition, there are several different varieties of turmeric, so make sure you are taking Curcuma Longa. A licensed healthcare provider, who is knowledgeable and has experience treating leaky gut, should guide any supplement regimen. There are a couple of general recommendations, however. Probiotics can be of great benefit but know that not all probiotics are the same, and not all are beneficial for leaky gut. Certain strains of bacteria have been well studied and shown to be effective. These include Lactobacillus Salivarius UCC118 (which helps repair intestinal lining) and Lactobacillus Rhamnosus GG (which hinders the ability of bad bacteria to develop a protective barrier around colonies). If you are taking probiotics for leaky gut, make sure they contain these specific strains. L-Glutamine is an important amino acid that regulates and restores intestinal barrier function. While it can be purchased as a single amino acid, I think it is more beneficial for soothing and repairing inflamed intestinal lining when combined with other botanicals such as aloe vera, ginger, and deglycyrrhizinated licorice extract. Digestive enzymes can also be extremely helpful as they break down the proteins that the immune system is reacting to. There are broad-spectrum enzymes available, but, in my clinical practice, I will prescribe the specific type suited to each patient. Exercise, especially high-intensity exercise that really challenges the body, can help improve hormone levels, increase growth factors that repair the body, boost endorphins that improve mood and lower pain and help the body’s immune system be less reactive to certain foods. While there is not a single pill or quick fix for leaky gut, correct dietary practices, healthy stress management, exercise, and the right nutritional supplements combined can have remarkable effects. Using a holistic approach to treating the whole person can repair the intestine’s protective barrier, lower inflammation and pain, regulate the immune system, boost hormone levels, reduce pain and discomfort, and improve mood, energy levels, and overall sense of wellbeing.